Club organizational business, including notices and minutes from directors meetings & elections. The New England Walkers explored ways to attract young participants, discussed a bid for a 2015 national championship, and elected a new vice president and member-at-large at the group’s annual meeting Oct. 19 in Groton, MA. Club president Ed O’Rourke identified his primary concern as promoting racewalking and reaching young athletes who are already participating in track. Tom Menendez said his experience in Maine underscored the need to show youths the value and the opportunity in racewalking events. He discussed the lack of available indoor tracks in Maine, and Ed Vaitones talked of similar challenges in New Hampshire. Ed O’Rourke offered a goal of compiling a 12-month calendar of workouts and clinics throughout New England. He, Ed Vaitones, and Rich McElvery will try to produce a schedule. Steve Vaitones said he has found little interest in racewalking among youth track and field groups in the Boston area, and said one-time clinics seem not to help. He said localizing events for youths is vital and developing personal relationships with high school coaches can advance the cause. Ed O’Rourke noted that a clinic scheduled for that morning on the Groton rail trail drew no one, although announcing the event in the local newspaper was easy to do. Steve said he is able to schedule races that precede track meets at MIT because he and Justin Kuo manage the meets. He said it is also possible to add a racewalk to a track meet at the Reggie Lewis facility at Roxbury Community College. Members discussed bidding to host the national one hour championship for 2015. If that race is not open for bid, perhaps the club could bid for the 10K or 15K, Ed O’Rourke said. Steve said the 10K or 15K would require more amenities than the one-hour, and the club would need to find a suitable road course. Members discussed Devens as a possibility. The club will continue the New England Grand Prix in 2015 with the established schedule of races. Members voted to increase the annual dues to $10 for an individual and $15 for a family. Ed O’Rourke said he wants to continue the monthly conference calls with other club officers to further our agendas. Rich McElvery was elected club vice president, succeeding Brian Savilonis, who chose not to continue in the position because of other commitments. Ed Vaitones was elected member-at-large to succeed Rich. Continuing in their positions are Ed O’Rourke, president, Justin Kuo, treasurer, and Charlie Mansbach, secretary. Attending the meeting were host Ed O’Rourke, Tom Knatt, Annie Montgomery, Joanne and Bill Harriman, Anne Neuburg, Brian Savilonis, Rich McElvery, Ed, Steve, and Valia Vaitones, Joe Light, Tom Menendez, Kayla Allen, and Charlie Mansbach. 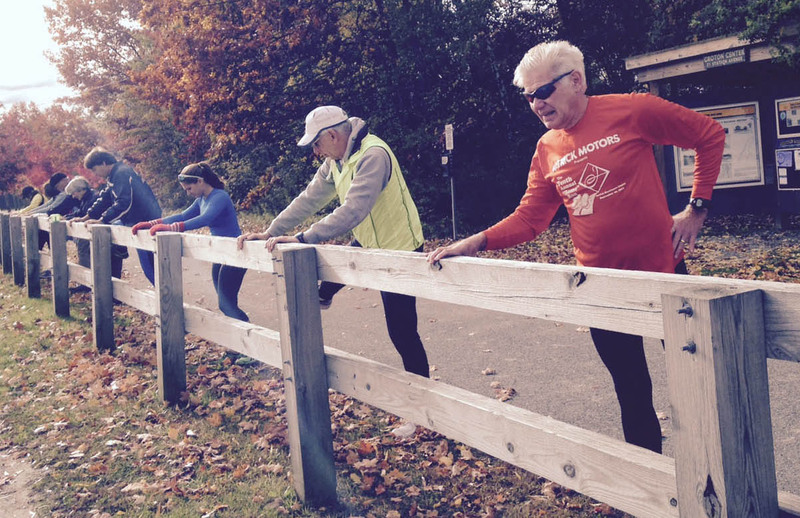 Warm up exercises for the race walk prior to the New England Walkers annual meeting and potluck. The 2014 New England Walkers Annual Meeting and traditional potluck will be held on Sunday, October 19th in Groton MA. Prior to the meeting, there will be a 5K/10K walk on the Rail Trail, starting at 9:30 a.m. from the end of Station Ave. in Groton Center. The event is open to race walkers of all abilities, and is often informally grouped to different paces. Members may suggest other agenda items by emailing Ed O’Rourke (eorourke@geiconsultants.com) prior to the meeting. All are welcome to attend, but only paid members may nominate and vote. The traditional potluck will follow, around noontime. Please RSVP to Ed (eorourke@geiconsultants.com) if you plan to attend the meeting and potluck. No need to RSVP, if you plan to walk only. Bob Keating and Pat Godfrey are the winners of the 2012 New England Racewalking Grand Prix. Scores are based on a walker’s times in four events compared with international age-graded tables. many other walkers with 1, 2, or 3 races. New England Walkers members have discussed changing the format for our Grand Prix, which in recent years has let walkers select their four best races from nearly a dozen possible events, most of them short. One possibility is to narrow the list of events, selecting perhaps four major races, each a different distance, and encouraging walkers to complete the full circuit. All ideas are welcome. Please pass along your thoughts through this yahoo groups address or through our google groups discussion page. New England Walkers members pledged support for the 2013 US-Canada Junior Racewalking meet, reelected officers, and heard a request for a new president to come forward next year during the club’s annual meeting Oct. 14. Members reelected Tom Knatt as president, Ed O’Rourke as vice president, Justin Kuo as treasurer, Brian Savilonis as member at large and Charlie Mansbach as recording secretary. Upon reelection, Tom said his tenure as president has now reached 31 years and he would like someone else to step into the role a year from now. Steve Vaitones furnished details of the US-Canada races, which will be held in late July or early August at the same East Boston site that was used for the 2011 event. The meet will mark the 25th anniversary of the series and may be broadened to include participants from other nations. He asked that NEW members help organize, promote, and conduct the races and take part in an all-comers race. Club members voted to set aside $500 to support the match. Members also voted to allocate $200 to streamline and personalize the Jeff Salvage racewalking flier, adding information about our club and distributing it at races. Steve, Ed, and Brian talked about updating our newalkers.com website and our NEwalkers page on Facebook and asked that members offer thoughts on what is most needed to make the sites more effective. Bill said he would post information on upcoming races. Charlie raised the question of whether to change our Grand Prix, which has grown to include more than a dozen events, most of them short, without creating a discernible increase in participation. Steve suggested an alternative of setting up a shorter series of races for walkers to complete during the year — perhaps a 3K, 5K, 8K and 10K. Members’ thoughts are invited. Steve told the gathering that the One-Hour National Championships will be moved to the spring next year — somewhere between late April and the end of May — because the national calendar is being revamped. The location is uncertain; if the Bentley track is unavailable, we will look elsewhere. Those attending the meeting were Tom Knatt, Annie Montgomery, Bob and Hilary Keating, Bill and Joanne Harriman, Brian Savilonis and Ann Neuburg, Steve Vaitones, Ed O’Rourke, Bob Ullman and Charlie Mansbach. The meeting was held at Ed’s house in Groton, MA, preceded by the traditional untimed and unmeasured walks of the Groton rail trail and the traditional potluck lunch. Ed O’Rourke is now the New England Walkers Vice President. The New England Walkers elected officers for 2012, reviewed the upcoming calendar of races, and voted to support youth development activities during the club’s annual meeting Oct. 16 at the home of Tom Knatt and Annie Montgomery in Groton, MA. Officers reelected were Tom Knatt, president; Justin Kuo, treasurer; Brian Savilonis, member-at-large; and Charlie Mansbach, recording secretary. Ed O’Rourke was elected vice president, succeeding Beth Katcher, who chose not to seek reelection. Steve Vaitones reported on the US-Canada Dual Meet, an event for elite juniors held this past August in East Boston with New England Walkers support on many levels. The races, the course, and the logistics were well received by all, and Steve will look into hosting another international event at the site next year. Justin Kuo reported in absentia that the treasury contains about $6,800. After a discussion of how to draw new racewalkers, particularly young athletes, NEW members voted in principle to spend $250 on T-shirts, books, and other appropriate materials to help develop youth participation. Members agreed on a Grand Prix schedule for 2012 that essentially includes every judged race in our region, plus one slightly outside it, the national 10K championship in Albany. The other races are the Dartmouth Relays mile, the Greater Boston Track Club, New England Masters Indoor, New England Indoor, New England Outdoor and Bay State Games 3K’s, the Seacoast 5K, the New England Masters Outdoor 3K or 5K, the national one-hour, and the Connecticut 10K. Walkers may also include a result from one other national championship. Tom Knatt reported that one-mile results from the 2011 Dartmouth Relays have been submitted for listing as national records in various masters age groupings. Members agreed to pursue holding a clinic led by Olympian Joanne Dow of Manchester, N.H.
Bill Harriman told members that he continues to hold coaching sessions year-round on Tuesday evenings in Lexington. Members discussed the appropriateness of letting lap-counters inform walkers of how many laps they have covered while the one-hour races are in progress. A judge halted the practice in this year’s race, then relented, saying that the issue will be discussed at a future meeting by USATF officials. The meeting was preceded by informal racewalks of indeterminate distances on the Groton rail trail and the usual potluck feast. Those attending the meeting were Tom Knatt, Annie Montgomery, Steve Vaitones, Paul Schell, Ed O’Rourke, Bill and Joanne Harriman, Bob and Hilary Keating, Brian Savilonis and Ann Neuberg Savilonis, Rich McElvery, Beth Katcher, Ruth Karacek, and Charlie Mansbach. New England Walkers members agreed at their annual meeting to help sponsor and conduct the Canadian-American Junior Racewalking Competition next summer in the Boston area. Members also reelected officers, received a treasurer’s report, outlined a Grand Prix schedule for 2011, and discussed club clothing, possible racewalking clinics, and the best ways to recognize volunteers and sponsors. Steve Vaitones told the group that the Canadian-American Junior meet has been held for the past 22 years, alternating between Canada and the United States, but never in Boston. The meet has a 10K for men and a 5K for women and allows unlimited guest competitors, which means that other areas that nurture young walkers, such as Maine and Ireland, could send participants. An all-comers race could be held in conjunction with the meet, with the race fee going toward the overall expenses. The date would be somewhere between the third week in July and the second week in August. Many tasks lie ahead: finding a site, putting together a budget, scheduling such responsibilities as pedestrian control, coordinating meals, refreshment, and lodging, and managing volunteers. The club voted to declare its interest in helping put on the event and to commit $500 to the cause, and Tom Knatt said he would draw up a chart outlining duties for volunteers. Tom read the club treasurer’s report submitted by Justin Kuo, which said we have $6,684.49 in our Sovereign Bank account, and then promptly collected $18 more from members who had been lax in paying their $6 annual dues. Tom led a discussion about obtaining New England Walkers T-shirts and sweatshirts, which he said would make good gifts to race sponsors. Steve said he would explore sources of inexpensive clothing. Members voted to acquire clothing of some kind. Members also voted approval of a list of Grand Prix races that includes the newly announced Eastern Masters Indoor 3K in Providence on Jan. 30, the Dartmouth Relays 1-mile, and our customary events: the Greater Boston Track Club and New England Indoor 3Ks, the Clamdigger 5K, the New Hampshire Seacoast outdoor 5K, the 10K Nationals in Albany, the New England Outdoor and Bay State Games 3Ks, the Eastern Masters Outdoor 5K, the One-Hour Nationals, and the Connecticut 10K. Competitors can also include a result from one other national or international race (such as one of the World Masters events in Sacramento next summer). Members also voted to solicit other events, especially one in Maine, to broaden the geographic range. Members discussed having New Hampshire-based Olympian Joanne Dow conduct a racewalking clinic, perhaps at the Canadian- American meet or perhaps at the University of New Hampshire, where she spends much of her time. Tom said he would explore the possibilities with her. Club members discussed whether to extend complimentary membership to those who conduct or volunteer at races. Beth Katcher said it is best just to thank people, and to waive dues for those whose activities bring in funds (such as volunteering at the Tufts 10K and the Corporate Challenge). On the subject of recognizing sponsors, veteran race organizers Steve Vaitones and Joe Light stressed the value of sending personal thank-you notes. The club reelected its officers: Tom Knatt, president; Beth Katcher, vice president; Brian Savilonis, member at large; Justin Kuo, treasurer; Charlie Mansbach, recording secretary. Present at the meeting were Tom Knatt, Annie Montgomery, Beth Katcher, Bill Harriman, Joanne Harriman, Bob Ullman, Joe Light, Brian Savilonis, Ann Neuburg, Ruth Karacek, Steve Vaitones, Paul Schell, Charlie Mansbach. The meeting was preceded by informal 5K and 10K racewalks on the Groton rail trail and our traditional potluck lunch, hosted graciously as always by Tom Knatt and Annie Montgomery. The NEW board agreed not to pursue nonprofit status at this time, and discussed ways to recruit new walkers in its quarterly meeting on Sunday, May 16. The meeting was held in a Portsmouth, NH, coffee shop following the Portsmouth 5K and was attended by Tom Knatt, Brian Savilonis, Charlie Mansbach, and Ann Neuberg. Tom asked if there was merit in pursuing nonprofit or not-for-profit status rather than remain unregistered. Brian said most running clubs do not file for such status because of the effort involved, and Tom said he has been advised by Justin that we are fine for tax purposes to remain as we are. Tom said we will make clear that contributions to the club are not tax-deductible. Tom said he wanted to purchase NEW T-shirts and sweatshirts and has asked Larry Epstein for a cost estimate. Charlie asked whether anyone among the members needed more gear, and Tom and Brian explained that the clothing would be useful for recruiting new members. Ann and Tom said a gift of a sweatshirt to a race sponsor would be a nice gesture. We agreed to buy about 25 T-shirts and sweatshirts. Tom asked how best to recruit young walkers. We talked about consulting with Steve Vaitones, who works extensively with young track athletes, on the possibility of issuing flyers to potential racewalkers and offering coaching. Brian mentioned the Narragansett Blessing of the Fleet 10-miler as the one event we know of that draws lots of people who want to walk fast and could be an event where we could interest people in racewalking. We agreed to plan a summertime event for current and potential new members, perhaps a 5K workshop in Worcester or a walk on the Groton rail trail followed by a meeting. Minutes of annual meeting, New England Walkers Club, Oct. 18, 2009. Members of the New England Walkers elected a slate of officers at the club’s annual meeting on Oct. 18, 2009, in Groton, MA, and agreed on several measures intended to promote interest in racewalking. Those elected were: Thomas Knatt, president; Beth Katcher, vice president; Charles Mansbach, recording secretary; Justin Kuo, treasurer; and Brian Savilonis, member at large. Charlie Duane and Justin Kuo led a discussion of overhauling the club website through use of the WordPress format, and members voted to switch to the format and work on making the website more thorough and up-to-date, with schedules of events, results, and links to other sites. Bill Harriman added that we can easily list our upcoming events on the Coolrunning website at no expense. Members debated the appropriateness of allocating money to those who give racewalking clinics and do similar promotional work. Bob Keating suggested that such payments could get out of hand, and Justin told of giving racewalking instruction and being reimbursed not by our club but by the sponsoring organization. Members approved making such allocations, with Tom characterizing the expenditures as only covering gas money and other expenses. The question of whether our racewalking club should be involved in other types of walking events brought the same range of opinion that we have seen for months in our e-mail discussions. Josef DellaGrotte said that restricting our attention to our own events makes us too insular and that it is vital to reach out to participants in walking divisions of running races. He asked that we consider offering sponsorship to races that could further our cause. Justin said we shouldn’t become sponsors of events that are already being sponsored by someone else. Josef talked of the contacts he has made with race directors and the prospects of reaching large groups of walkers. There was informal post-meeting agreement that we have to pick our spots carefully and not try to make an impact in every event we hear about. Josef told of receiving encouraging responses to his efforts to teach proper walking technique, including a well-received article in the Worcester Telegram and requests to appear on a local cable TV outlet. Carol Kuo asked why, for our purposes, we needed to show people how to walk rather than just teach them racewalking. Josef said he will submit a statement on making the connection from walking to racewalking. Tom raised a question of whether distribution of fliers and business cards would help our cause. Justin cautioned against sending fliers to races where we would not be present because the material would probably be discarded. He said distribution of fliers at events we take part in, such as the Clamdigger, could be worth the effort. Tom also raised the possibility of doing a promotional video for the club and mentioned that an instructional video he made years ago could be incorporated into something new. Carol and others responded that plenty of material on how to racewalk is readily available on the Internet and that any video we did produce would have to be more focused on introducing our club to outsiders. Members rejected a motion to raise our $6 annual dues to $20 after Josef said we first need a plan on what to do with our funds. Following the unanimous vote, Tom said we should look into the pros and cons of becoming a nonprofit organization and discuss how to use our treasury. Maureen Rogers asked if New England Walkers jackets were available. She said that based on the interest she encountered when wearing her Bay State Games jacket, the NEW garb could give us welcome attention. Beth raised the possibility of asking the Somerville Road Runners to add a walking division to their annual 24-hour race in Wakefield. Such an addition could make the race an accepted Centurion event, in which racewalkers could try to cover 100 miles within the time limit. We would need to certify the course, which goes around a lake, and to furnish judges to enforce the contact rule. Tom asked, in the interest of attracting young athletes to racewalking, if any members were willing to contact high schools, colleges, and coaches. Despite talk of past efforts yielding little lasting results, Tom, Josef, Brian, and Larry Epstein said they were willing to make such overtures. Talk of reaching out to older populations mainly brought jokes about how old we are already. Members attending the annual meeting were Tom Knatt, Annie Montgomery, Brian Savilonis, Ann Neuburg, Joanne and Bill Harriman, Hilary and Bob Keating, Carol and Justin Kuo, Priscilla Frappier, Charlie Mansbach, Beth Katcher, Josef DellaGrotte, Larry Epstein, Charlie Duane, Richard Ruquist, Ruth Karacek, Ken Taylor, Maureen Rogers, and Susan Allison. The meeting began at about 1:50 p.m. and broke up into informal conversations at 4:10.